Husband needed to take a work trip to Portugal, we managed to schedule this during Son’s Easter holidays so we could tag along as well. A choice of basing ourselves in either Porto or Lisbon for the five day break – we opted for Lisbon, a tough choice but a good one, we loved it. I could rave on forever about this place, one of the most laid back and family friendly European cities ever. We found a host of attractions suitable for young and old alike plus it has the most perfect location near the Atlantic coast. Lisbon has been the world’s richest city twice in history and the glorious buildings that line every street bear witness to this fact. It has had periods of decay and many of those buildings are faded and crumbing but that just adds to the charm. Life is good here, the atmosphere is buzzing and we all just loved it. Lisbon is more or less in the centre of the country and the areas around it offer beaches, countryside, mountains and more. We found some stunning scenery and dramatic coastline less than an hour’s drive away. I just fell in love with the city though, so charming and so beautiful. It is full of bleached limestone buildings, narrow winding streets and cobblestone hills. Yellow trams clatter through the hilly streets, locals stroll through the old quarters and there are no end of wonderful places to eat and drink. It is a city of contrasts too, we found everything from modern high rise blocks to Art Nouveau buildings as well as glass skyscrapers in the Expo area. 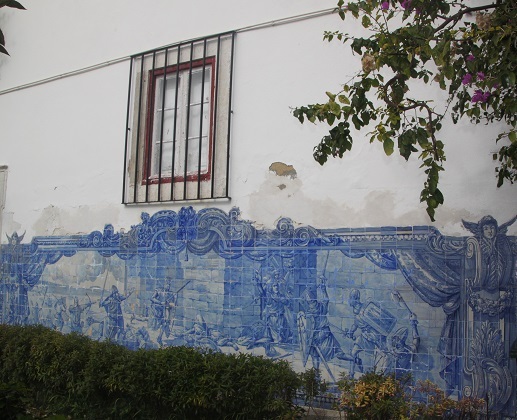 All that plus the most gorgeous mosiac tiled buildings in the Alfama and you just about get the idea. Riding Tram 28 – the old vintage yellow tram that clatters through the city streets and up and down the hills at break neck speed. It is a wonderful experience and a tram ride quite unlike any other I’ve ever experienced. 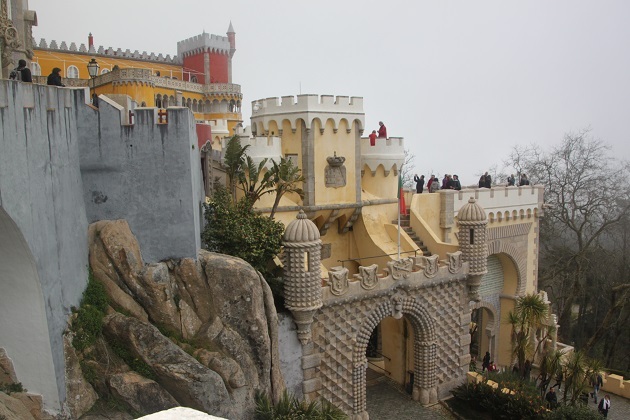 A day trip to Sintra to see the fairy tale castle there – despite pouring rain we were still enchanted. Colourful and unusual it was loads of fun to explore then we headed to the coast to the most westerly point of Europe and after that spent an hour on the beach at lovely Cascais. Wandering the streets of Lisbon, climbing up to the castle perched at the top of the steepest hill ever and then enjoying the most incredible views over the roofs of the tiled houses down to the river. 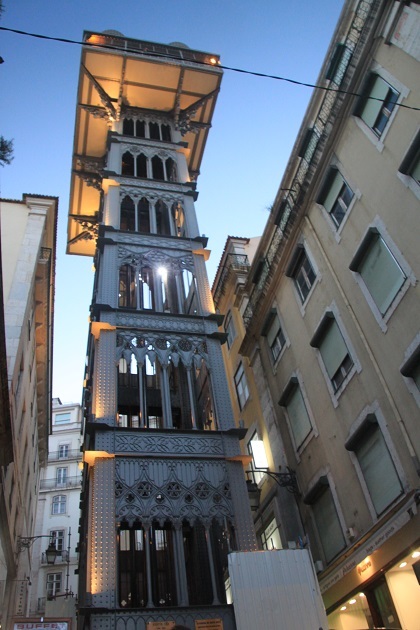 Taking the Santa Justa elevator – this is a stunning old lift in the middle of the city, beautiful just to ride it but the views from the top (especially at night) are incredible. Visiting the Expo part of the city – a real contrast to old Lisbon but still impressive we really enjoyed taking a cable car ride for a bird’s eye view. Spending a morning at Belem, checking out all the monuments there and imagining the explorers who once set sail from this place then feasting on custard tarts from the famous bakery there. So pleased to read that you visited Lisbon at Easter and that you enjoyed it so much. You didn’t have to travel as far as us for the Portuguese egg custard tarts either’. Lovely photos Joy. That’s true – we did sample a few at Belem – they were more than delicious!! We had such a great time there – it’s a beautiful city with so much to see and do. I’d been wanting to visit for a long time too and I wasn’t disappointed when we finally made it there. Ah, yes, we loved Lisbon, too. A friend recently told me her husband and daughter are running a race there soon and I told her about the hills. I was relieved to hear the route is along the water! Beautiful photos; they brought back our lovely trip just a year ago. Definitely would not fancy running up those hills – along the water sounds like a much better option!! It is a gorgeous city, we took so many photos it is quite the job to go through them but that’s all part of the fun! Joy, we have never been to Lisbon, but your photos make me want to go. I would love its architecture and tiled buildings, for sure! Will be looking forward to more of your trip! It is simply gorgeous Pam, I’m sure you would love strolling around and taking in all the wonderful sights. We really enjoyed it here, now to get round to sorting through all the photos and writing up more posts!! Will you visit Lisbon? We loved it here, would definitely recommend a visit! Lisbon is a beautul city, I love it too! Your photos are very nice. Thank you – the city is so photogenic and lovely, I don’t think you could get a bad picture!! We were so impressed with Lisbon and just everything about it. Thanks Suzanne – isn’t it gorgeous, I would go back again in a heartbeat. My family went to Lisbon after my sister’s GCSEs, but I missed out as I was in the midst of university exams. It looks like a fantastic destination, with tons to see in and around the city – the panoramic views of the city look quite something, and I love the vintage trams! The trams are gorgeous, we rode one and it was quite an experience I can tell you!! It is a gorgeous city, shame you missed out but hopefully you make it there sometime Rosie. Wow! Looks amazing, if I ever get to Lisbon your highlights will sure be on my list 🙂 Thanks for the insight. It is a fantastic city – it was hard to pick out highlights as we enjoyed every bit of our stay! Libson looks fantastic, and it looks like you had a fantastic time. The view of the tiled roofs was breathtaking even in picture, so I can only imagine how amazing it was in person. It is so colourful and such a vibrant city – a picture postcard view around every corner. One of my favorite cities! Glad you enjoyed it. Hope you visited the anazing monastery in Belem. I think it’s definitely up there with my favourites too. We loved it – we did visit the monastery and really enjoyed that too plus strolling along the water’s edge at Belem. Nice post and very useful. We are going to Lisbon later this year as part of our annual holiday. 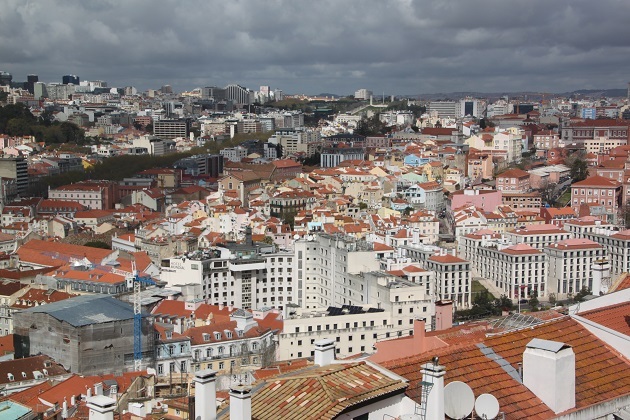 Fly to Lisbon and then take the train to Porto and fly home. Thanks for the information. That sounds like a great trip Andrew – I’m jealous. We went to Porto 23 years ago and having had such a great time in Lisbon I’m itching to go back and visit both again. We are going to take the train between the two cities and stop off in the towns along the way. Really looking forward to it! Where is your next trip? Sounds great – Holland is our next main one. Wow, that bridge is so like the Golden Gate Bridge in San Francisco! I really love those red tile roof tops. It really does look like the Golden Gate Bridge and is gorgeous. The views from that side of the river back over towards Lisbon were some of my favourites. We just loved Lisbon Vanessa, I have long wanted to go there but didn’t realise I would fall in love with the city quite so much. My husband and I visited Porto years and years ago when we first got married, I remember loving it too but it is such a long time ago I think we definitely need to make a trip back there. Same here, we went to Porto for the first time in 2004, it has changed quite a bit since then. There are definitely a lot more tourists around but worth another visit for sure. Just like Lisbon! I’ve never been to Portugal. Had we still been in Scotland, our next city breaks were going to be Berlin and then Lisbon. Hopefully some day I will make it. The city looks and sounds like it has a great deal to commend itself for a vacation. Berlin is next on our list – not sure when we’ll make it there but hopefully in the not too distant future. 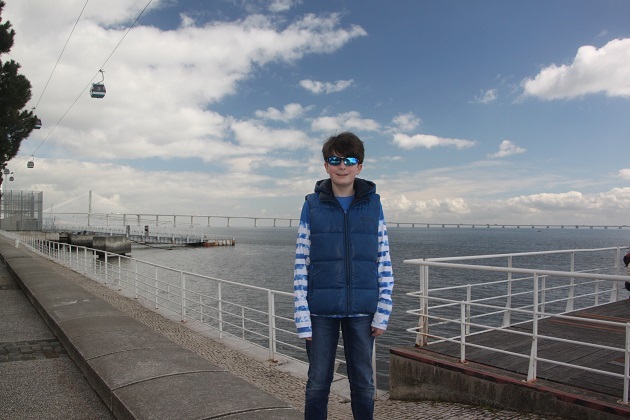 We did really love Lisbon – it is gorgeous, the atmosphere is wonderful and I haven’t a bad thing to say about it!! Hopefully you do get to go sometime Laura. WOW! 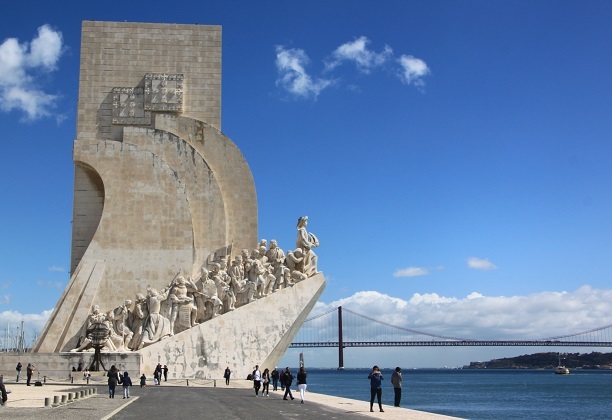 I’ve never been to Lisbon and it was not really on ‘my list’- it defo is now, it looks amazing! Thank you for sharing! It is a beautiful city with so much to see and do – I definitely recommend a trip, we loved it. We are hoping to travel to Spain and Portugal later this year so read your post with interest and enjoyed your photos too. Thanks Mark, will be looking forward to reading your take on it all too!! We’re really lucky Corey to sometimes be able to tag along on his work trips. He did have to work a few days but was also able to spend some time sightseeing with us as well. My son is great company though and loves exploring a new place with me. My husband will have to go back to Portugal sometime soon, I’m crossing my fingers we can go back with him and do something similar in Porto. Oh, those tarts still make me drool – just the thought of them!! I love Lisbon too, looks like you had an amazing time! The food and the atmosphere are so much fun! It’s such a great city we just loved everything about it. Isn’t it just such a fantastic city, we loved every second of our stay. I would visit again in a heartbeat too!! Am reading so much about Portugal lately that I believe it’s really going to be the next big thing in travel. Thanks for the great coverage, love that bit about the tram ride. 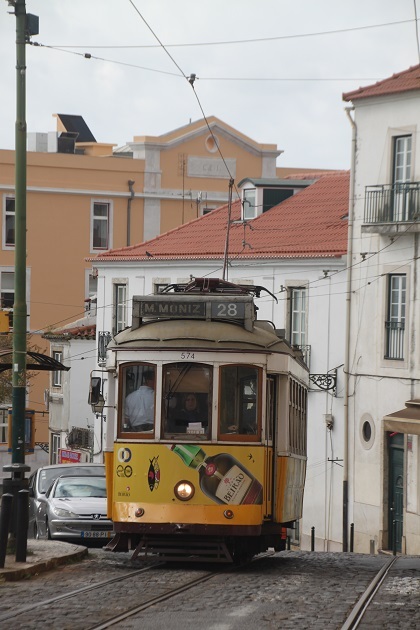 It is a great country to visit – we loved Lisbon, have also been to Porto and the Algarve and enjoyed those places too. That tram ride was so much fun. Thanks for this. Lisbon is now going on my to do list! It’s a great city to visit, we had such a great time and would definitely recommend! Gorgeous Photos! We also loved Lisbon, and I’m hoping to get back one day, there is just so much to do and see there! We were surprised and delighted! We were surprised too Hilary, I never expected to love it quite as much as I did. It is gorgeous and we had such a great time – I hope we can go back sometime too. We’re headed there in a few weeks and now I’m even more excited! Thanks for sharing! You’re lucky – I wish we were going back again, it’s great. I hope you enjoy as much as we did! Lisbon was such a wonderful city to visit, beautiful with a great atmosphere, we definitely recommend! Wow…beautiful scenery and that fairytale castle is gorgeous! How was it inside? It was fun exploring inside George – all the furnishings etc are intact so plenty to see. Just very crowded though! Our son absolutely loved it here and said he would definitely go back so it got the kids thumbs up in our family! The sights around the city are fantastic and there’s plenty to keep kids occupied and engaged for sure. So nice to read your post about Lisbon and see all the pictures – I loved it too when I was there and this really makes me want to go back! It is the most wonderful city and such a great place to spend a few days. We loved it and would definitely go back as well. The tram is such a lot of fun – a bit different to our trams here Rosemary for sure!! Hope you make it there someday, I’m sure you would love it. Hope your time in England and Switzerland go well – fingers crossed for good weather. 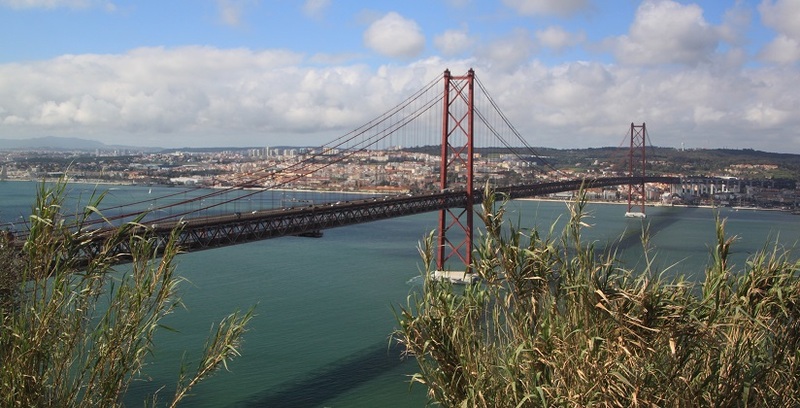 Thanks Joy – yes we must get to Lisbon one day! Looks a bit cold over in the UK this week but a bit more promising next week. I have packed layers!! Icy today Rosemary – bring plenty of layers!! Will do Joy – still mid 20s maximums here so I know I’ll feel the cold!! 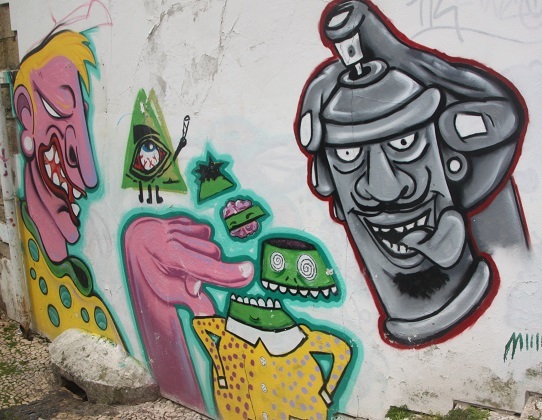 I loved the variety in Lisbon too. The Expo felt a world away from the old town. The foodie treats, the tarts and cherry liqueurs, also perked me up! Absolutely!! I know exactly what you mean – who couldn’t fail to perk up with one of those delicious tarts. I will be going to Lisbon for a couple days and have been wondering how to divide the short amount I have there. This has been great, thanks for sharing! Hopefully it might give you some ideas – it’s a fantastic city, hard to squeeze everything in but I hope you have a great time. Fantastic! Going to Lisbon very soon, so well worth reading this for the tips! Oh I’m sure you’ll love it – we definitely did!! Time flies past far too quickly – he’s growing too fast!! It was wonderful to be here at Easter, we loved the city and everything about it for sure. Definitely ride Tram 28, go to the castle for the views and we also enjoyed taking the ferry across the river and seeing the city from a different perspective. It’s lovely to just wander though and soak up the amazing atmosphere. Ah great photos and totally agree with everything you said. It is family friendly but not baby friendly. Those hills really did us! Hadn’t thought about that aspect – you forget very quickly the baby stage but I can imagine what a nightmare it would be with a baby, the hills are hard enough when you just have to drag yourself up them!! 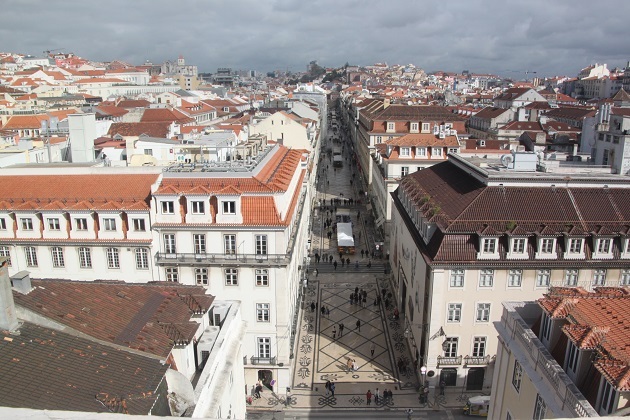 Lisbon really looks like the place to be if you want to spend a city trip! I’ve never heard of Sintra before, it looks pretty! 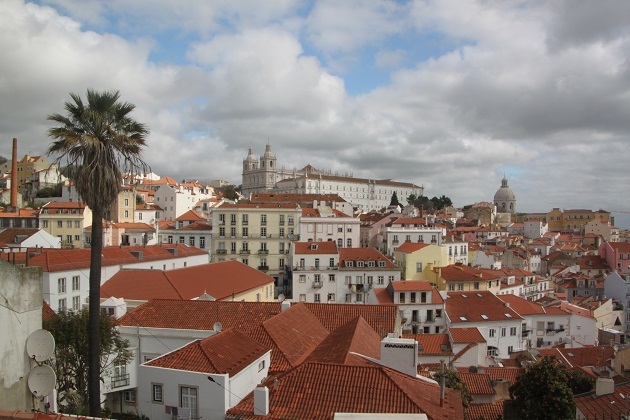 We had such a great time in Lisbon – it is really a wonderful city and the trip out to Sintra was great too. The weather wasn’t too great but we still enjoyed exploring. Thank you – it is a wonderful city, we loved it and would definitely recommend. Your son is growing! 🙂 🙂 Glad you enjoyed Lisbon. We loved it Jo and yes, he’s getting too big too fast!! Oh wow! It does look charming! I need to add this to my places-to-visit-soon list! 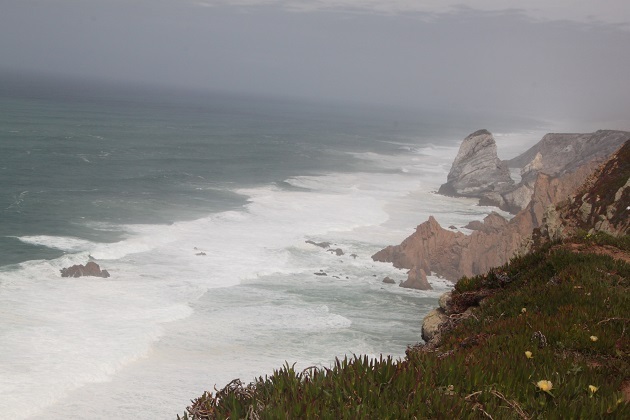 It’s beautiful, we would love to go back and explore properly, we only got a taster of what Sintra has to offer! Thank you Al – hope you enjoy Lisbon as much as we did! !